Muffle Type Mesh Belt Furnaces manufactured by our organization are extensively used for plant sintering, bright annealing, brazing and tempering. These products are used in inerted environment configuration. Muffle Type Mesh Belt Furnaces include Muffle type mesh belt furnaces. 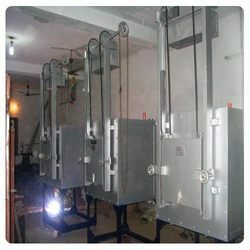 Electric Chamber Furnaces manufacture by us is set of units such as shelves and workbenches. These products manufactured with good quality raw materials using advanced technologies. Our electric chamber furnaces are run in natural air environment. Electric chamber products are having two types that are B and D types. These products are used for heat treatment with 1000’C temperature. Looking for Sintering Furnaces ?